For a new parent, it can be frustrating not knowing what your infant’s wants and needs are. What does a loud screeching cry mean? Does it mean that he is hungry or hurt? What about a soft cry? Aside from the crying, what do her body signals mean, such as arching her back, rubbing her ears, or moving her arms around? These are all questions that go through a parent’s mind on a daily basis when they are caring for their infant. Infants communicate well before they are able to speak and are born with the ability to express many different, and rather important, emotions. Here are some general principles that are useful in decoding those cues. 1.) 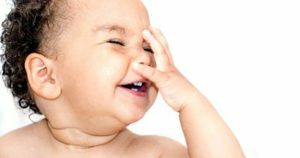 Making Faces: Infants have many different facial expressions, from frowns to wrinkled foreheads, they can be momentary and go unnoticed. Gaze aversion happens when an infant turns his face away when he needs a break from eye contact. Infants will disconnect when they feel overwhelmed, or overstimulated. When this happens, it is best to respect her downtime, wait patiently and quietly until she turns back to you, then smile and re-engage. Smiling occurs between six and eight weeks and likely signals that he is content. When your infant smiles at you, smile back and react positively, even if she does not understand your words, she will get the message. 2.) Body Language: About 90 percent of communication between infants and adults is non-verbal. Body language, such as your infant making fists when he is hungry, plays a significant part in staying in tune with his needs. One common body language cue is your infant arching her back. This is usually a sign of discomfort, or often happens when she has had enough to eat and is trying to get in a more comfortable position. This cue can be responded to by switching positions for her, or giving her some free time to move around on the floor. Crying is the most abrupt way for your infant to let you know that she is hungry, in pain, upset, or tired. A hungry cry is generally a low-pitched cry that does not usually last longer than over a second. Respond by picking her up and feeding her right away as it is important for them to know that you are there for her needs. Another type of crying is a pain cry, which is usually sudden and continuous and does not change pitch. Make sure to go through a mental checklist to determine why she is experiencing discomfort. 3.) 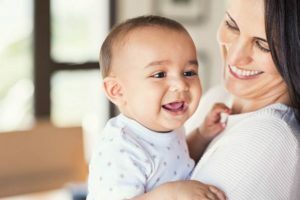 Early Language: Infants usually start communicating verbally, between two and three months. This is also when your infant will start to mimic your pitch and tone. He will express a range of emotions, such as being happy, sad, mad, irritated, or satisfied through cooing, babbling and laughing. It is best to narrate your activities to her throughout the day, giving her the chance to respond and babble back to you. This encourages her to develop her communication skills which are crucial for her development. As difficult as it may be at times to decode these infant cues, taking the time to learn what they mean and respond in a positive way makes an incredible difference. A wonderful app for new parents is Wonder Weeks and has proven to be right on point in helping parents to decipher what their child is trying to tell them!